Kirsten has been performing at Live Music Yoga classes for the past decade and her music can be heard at Yoga centers worldwide. 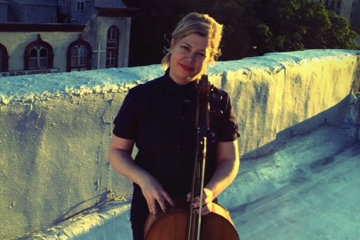 She is a cellist and composer with an eclectic range of collaborations under her belt- from punk, dance, theater, radio, film scoring and electronic music to live art installation performances. Sonic Youth’s Thurston Moore released her first solo album on his label, Ecstatic Peace. Kirsten has been influenced by her personal yoga practice and the music currently coming out of the New Age and Yoga genre and she infuses the healing sounds of the cello mixed with deep electronic tones, creating an unforgettable experience that leaves the class feeling magical and transformed.